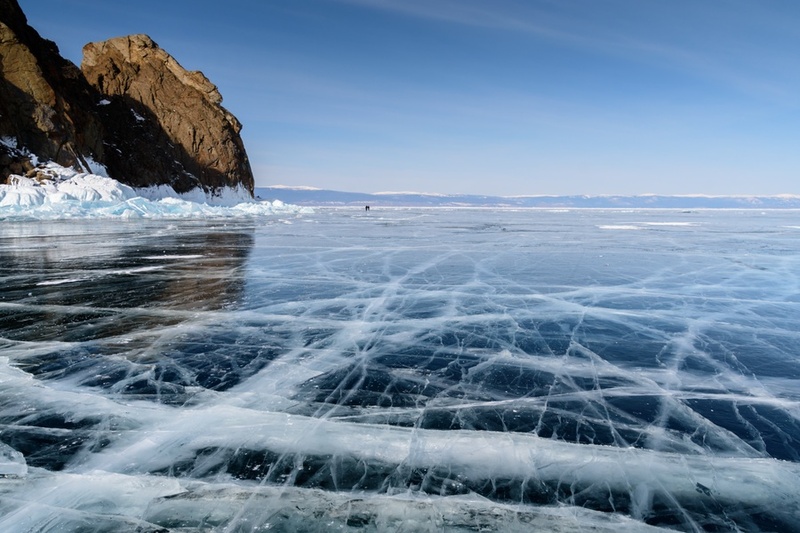 Lake Baikal is a geological wonder and is the lake of the extremes: let's go together to the Baikal lake in winter, crossing it completely and sleeping on its thick ice, discovering all the incredible facts of this fascinating place in Siberia. 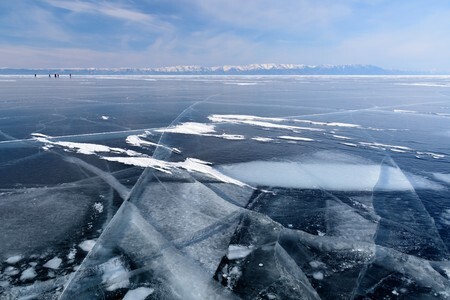 Lake Baikal is the largest freshwater basin on the planet and contains over 20% of whole world's freshwater (not counting the polar ice caps). With its maximum depth of 1642 meters, Lake Baikal is the deepest lake in the world. 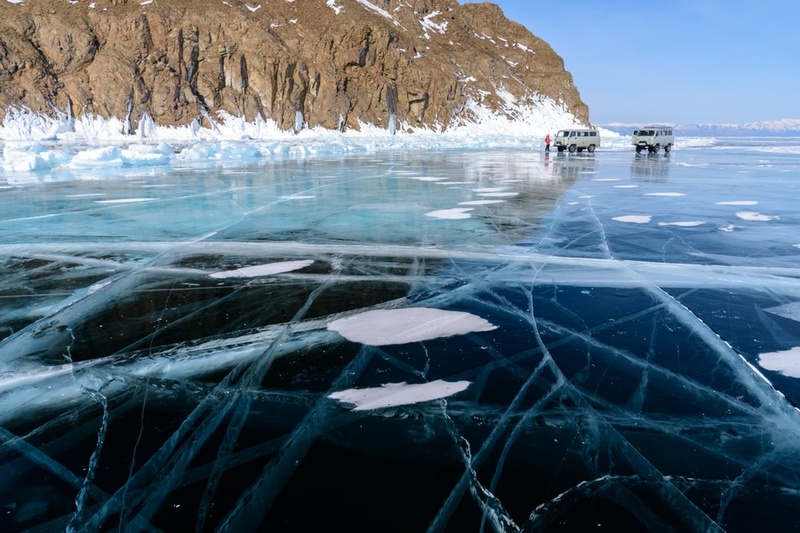 Since the surface of the lake is 456 meters above sea level, it means that its seabed is up to 1186 meters below sea level (without considering the thick layer of sediments), representing therefore (at least virtually) the deepest depression on Earth. 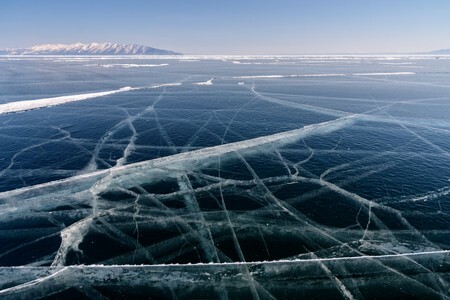 Lake Baikal is 636 kilometers long and about 79 kilometers wide. By extension, it is the largest lake in Asia. 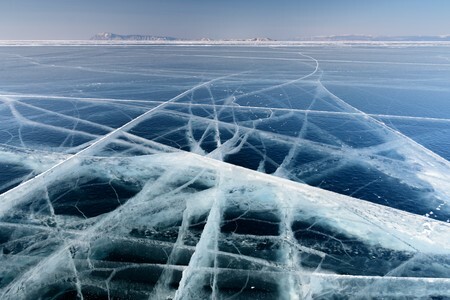 Lake Baikal is located in southern Siberia, not far from the border between Russia and Mongolia. 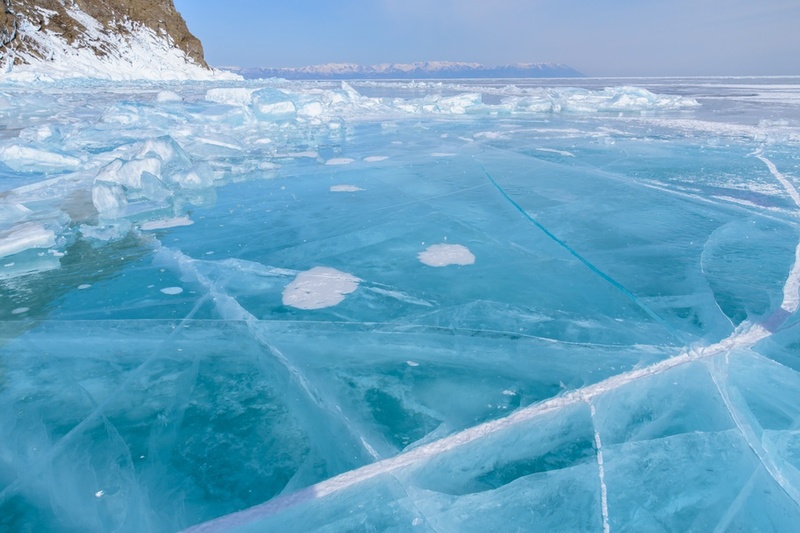 The water of Lake Baikal is one of the purest and clearest water in the world, with the visibility exceeding 30-40 meters, especially in winter. 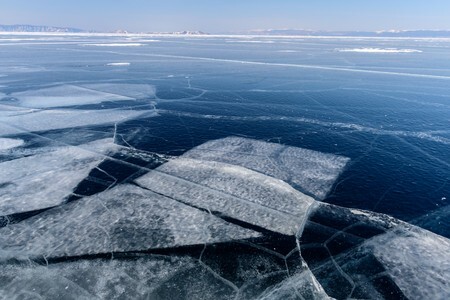 This purity is given by various factors, but complex biochemical processes guaranteed by various microorganisms play a fundamental role because they cause all impurities to fall to the bottom of the lake. 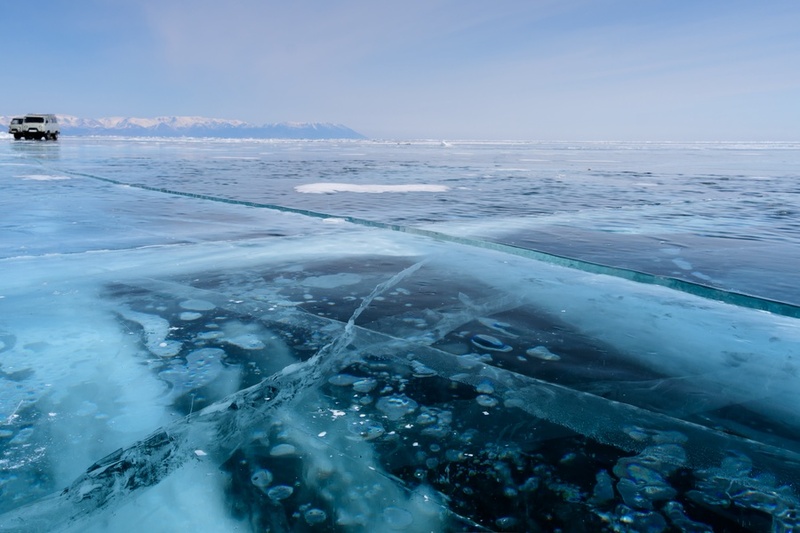 It is not for nothing that the sediment layer on Lake Baikal's bottom is the thickest on the planet and reaches an incredible thickness of 8500 meters! 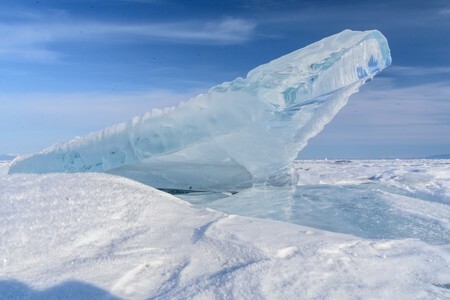 (Yes, almost the height of Mount Everest!) This makes the depression below Lake Baikal virtually almost as deep as the Mariana Trench. Lake Baikal has an estimated age of 25-30 million years, making it the oldest lake in the world. 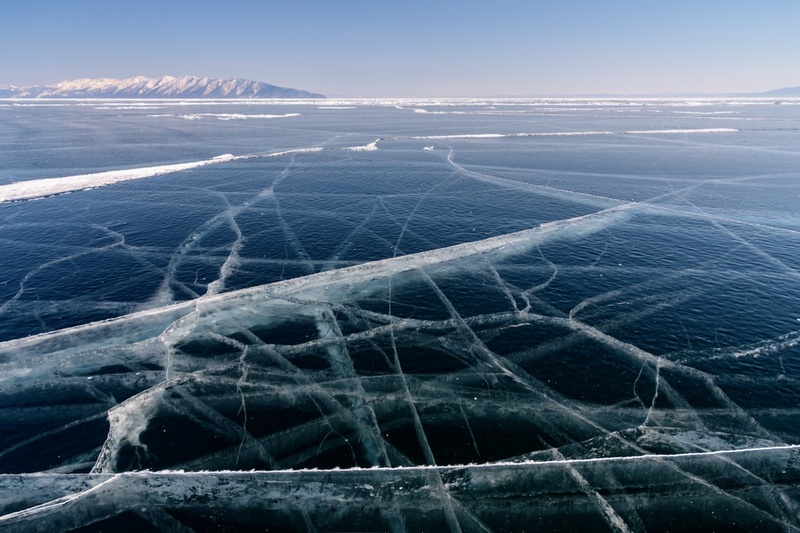 Lake Baikal is located above a large fault with tectonic plates that, by separating away, make the lake 2 centimeters wider each year. The area is seismically very active with about 2,000 earthquakes per year, usually imperceptible or very weak, while violent events of a magnitude greater than 7 occur every some years. 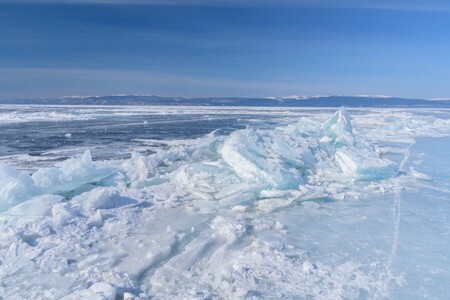 Lake Baikal has only one emissary: the Angara river, which is one kilometer wide near the source. 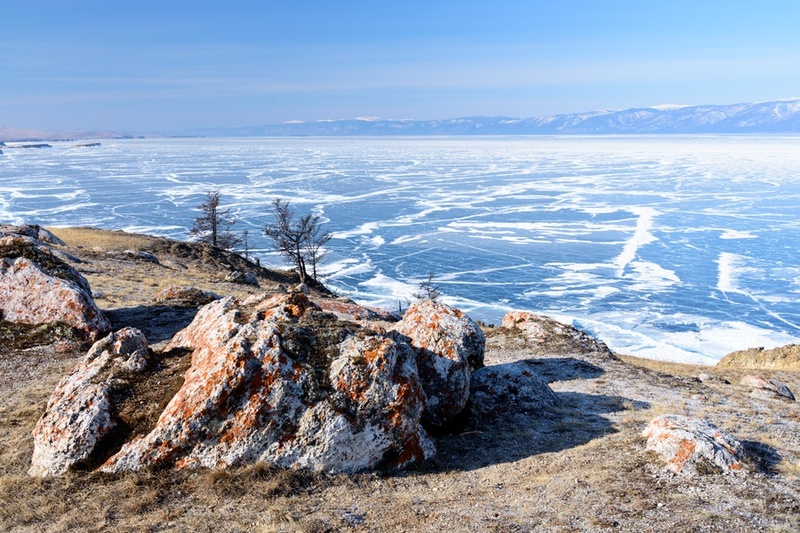 Instead, over 500 rivers flow into the Baikal, some of which are only seasonal. It takes 383 years to have a complete replacement of all the water in Lake Baikal. Baikal Lake is home to lot of endemic species that are not found in other parts of the world, such as the only fresh water seal on the planet. From January to May, Lake Baikal is uniformly covered by a sheet of ice between 50 and 140 centimeters thick, which can hold a load of 15 tons (considering just the minimum thickness). 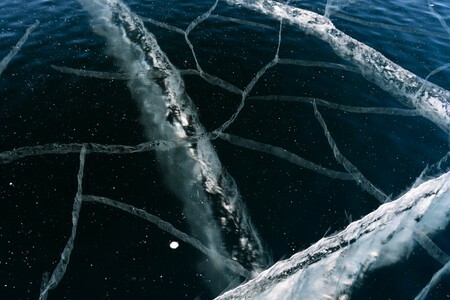 Water oxygenation is guaranteed by endless veins and cracks in the ice along the pressure ridges. 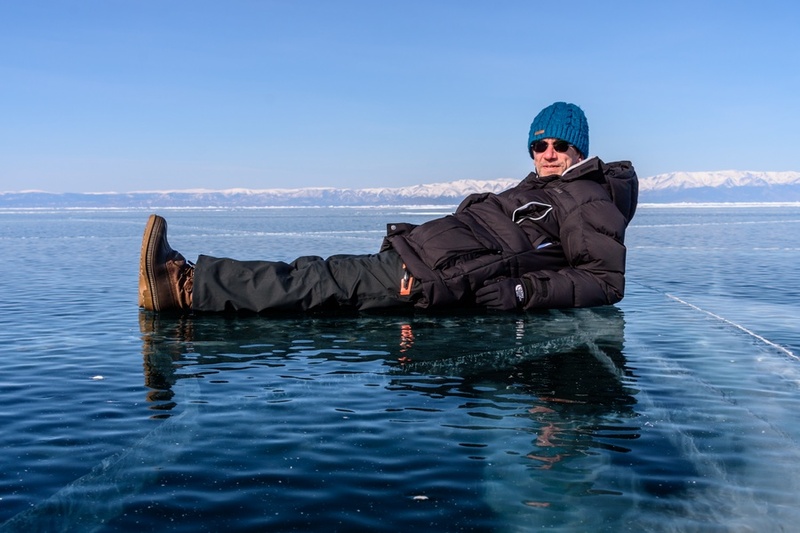 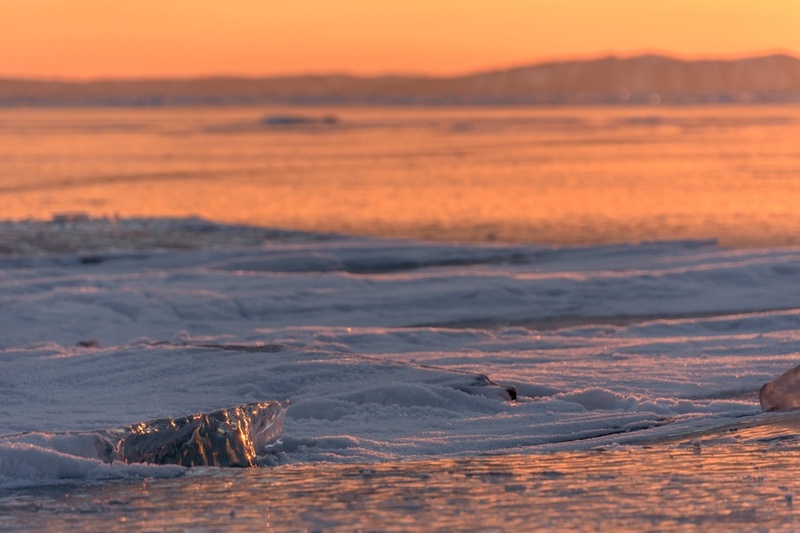 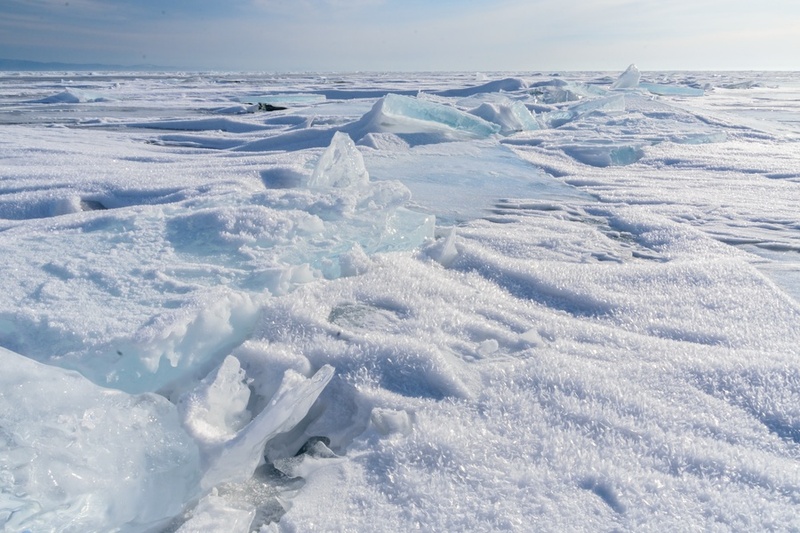 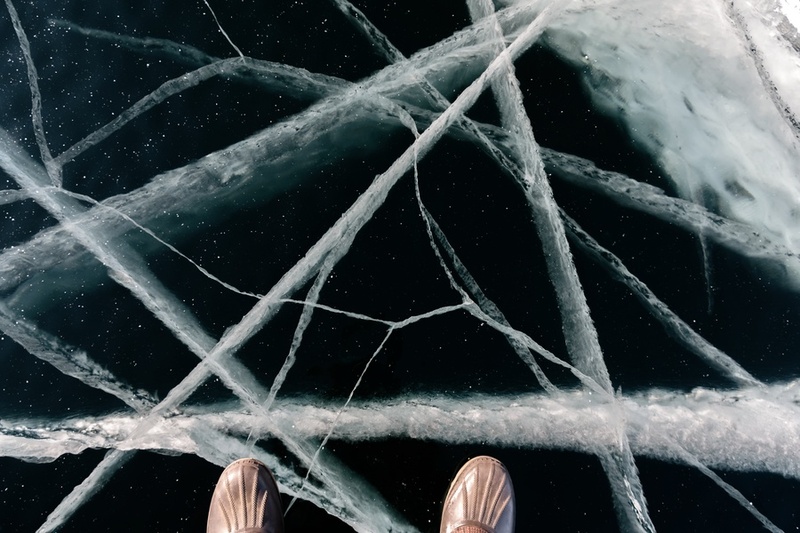 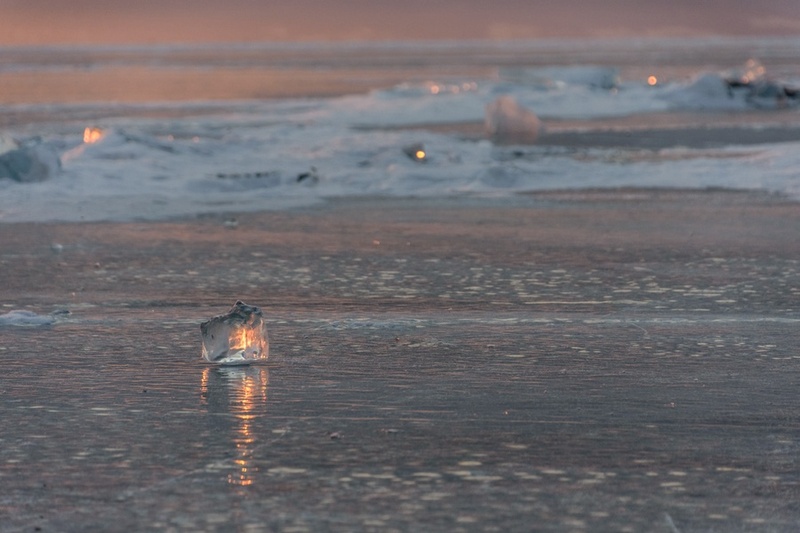 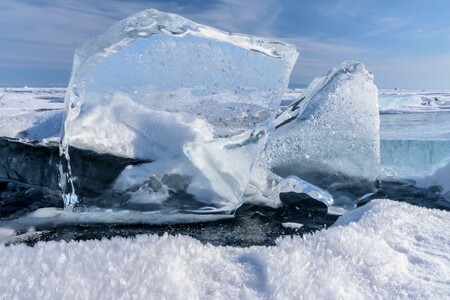 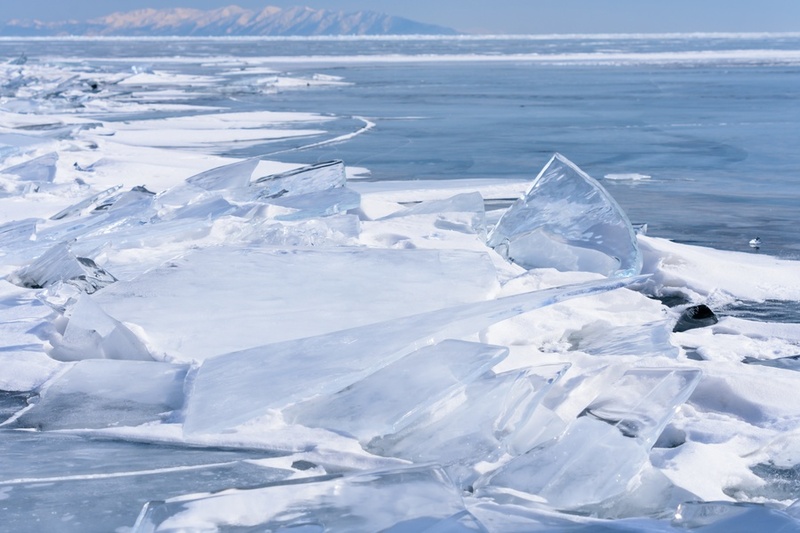 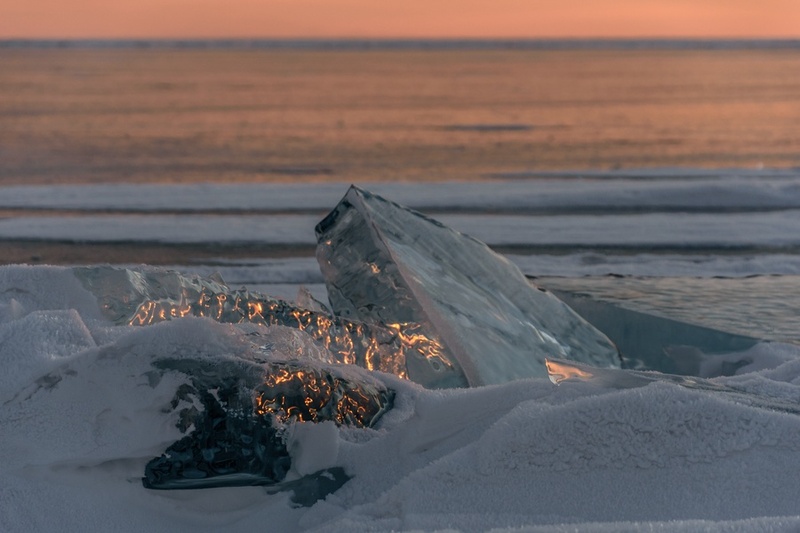 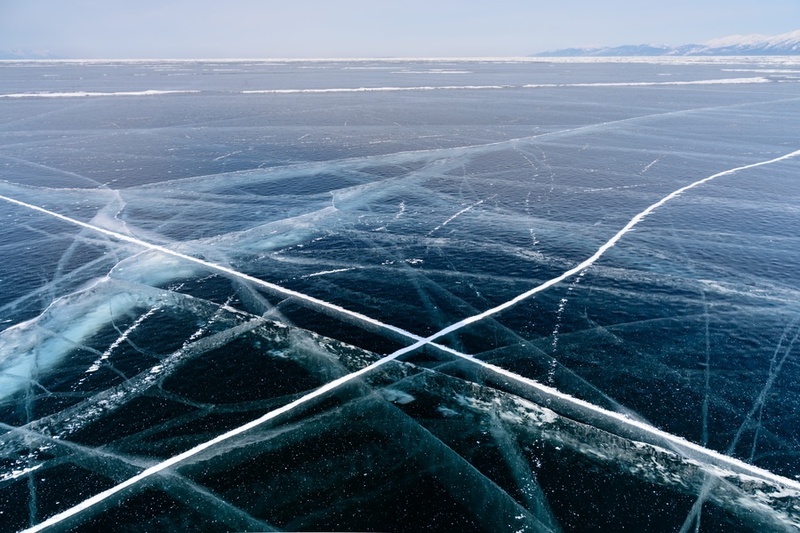 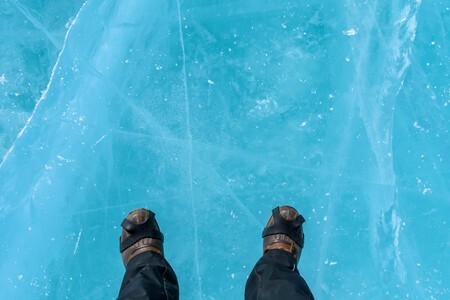 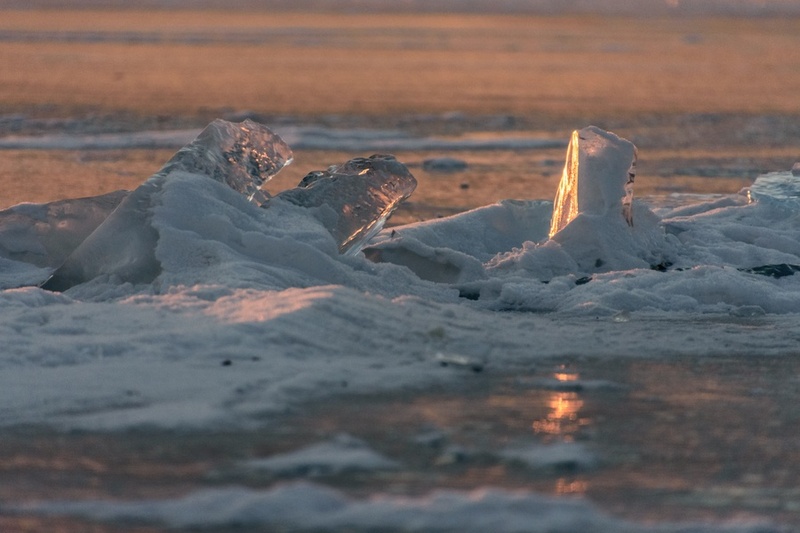 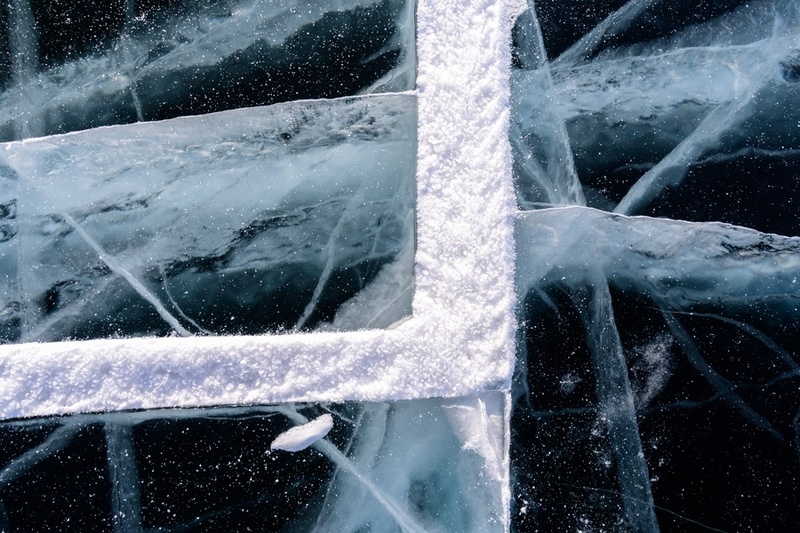 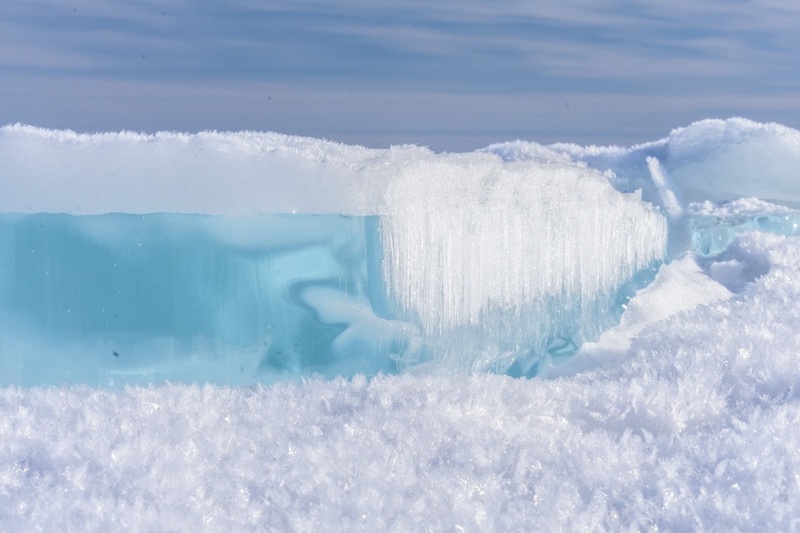 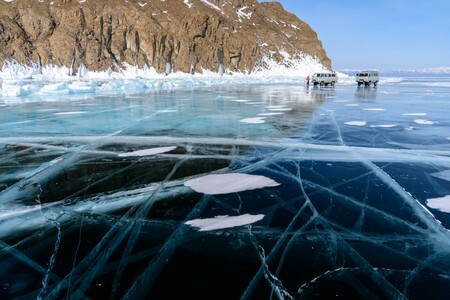 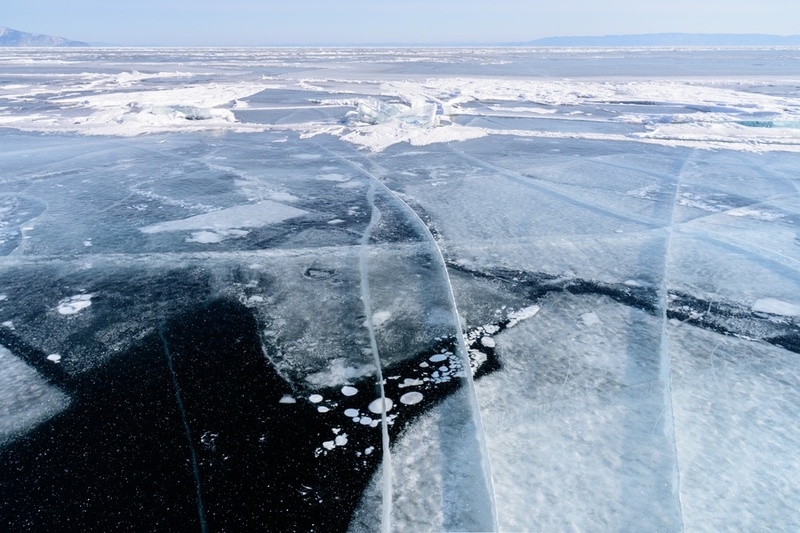 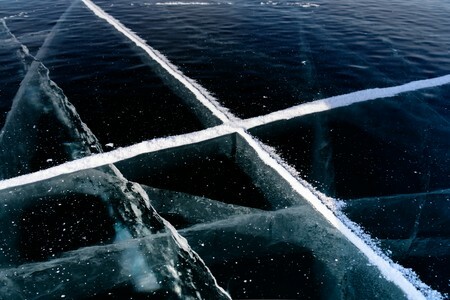 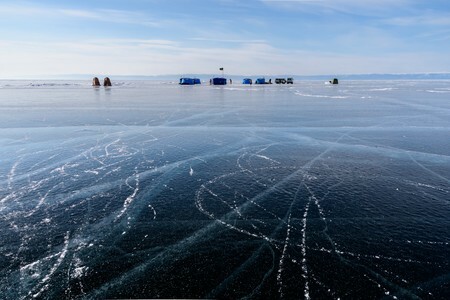 The best time to observe the transparent ice on Baikal lake, safely moving on the ice by car or hovercraft, goes usually from mid-February to mid-March. 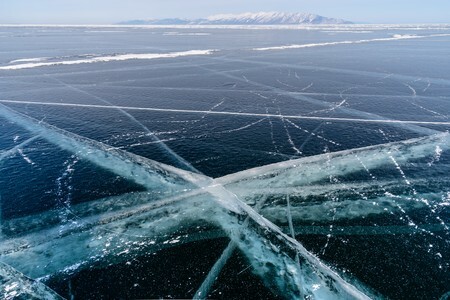 The water temperature of Lake Baikal is +3 degrees centigrades below the ice layer and slowly increases with depth to +4 degrees. In August the surface water can reach +16 degrees or even +24 degrees in the most protected bays of the southern regions, while in depth the temperature remains around +4 degrees for the whole year. 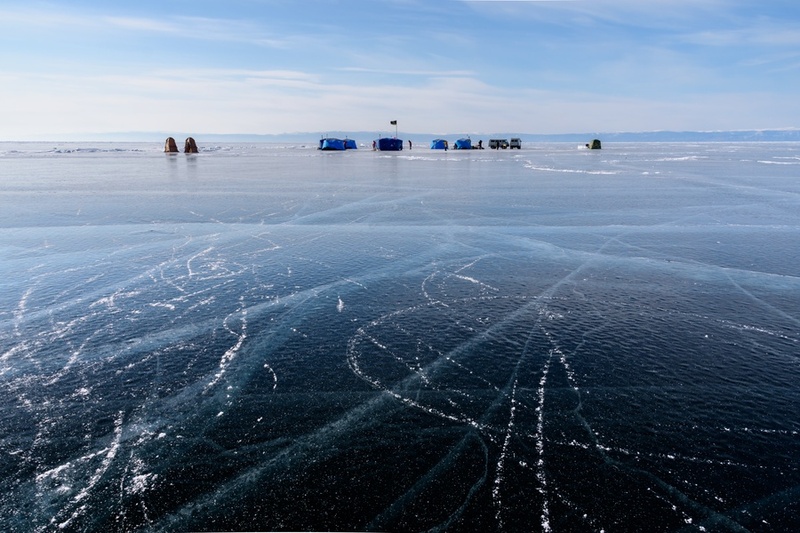 A storm on Baikal lake may generate 4-5 meters high waves. 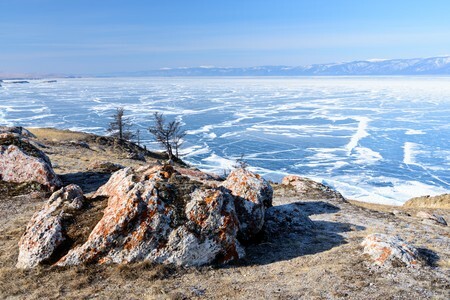 Lake Baikal has one of the best climate of Siberia, with very cold but very clear winters and mild summers with little rain. The Olkhon island is a kind of sub-arctic desert. During the winter, between December and February, temperatures may drop down to -40 degrees centigrades (made even more chilly by the wind that blows rather frequently) while in full summer they may exceed +25 degrees centigrades. 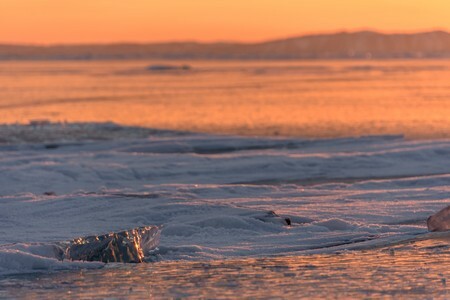 But now let's see some photos of Lake Baikal, taken in early March on a crossing expedition aboard a 4x4. 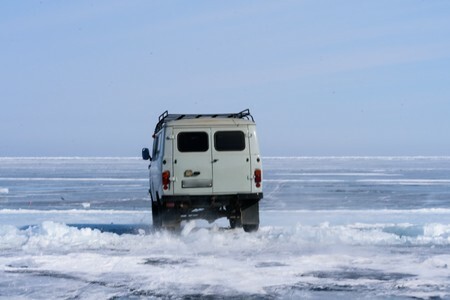 A map showing the route followed aboard a 4x4 to cross Baikal lake, with an overnight stay in a tent near the point where the Baikal Lake is deeper. These mini-expeditions are generally possible between mid-February and mid-March, when the ice is transparent, perfectly safe and little contaminated by frost or snow. 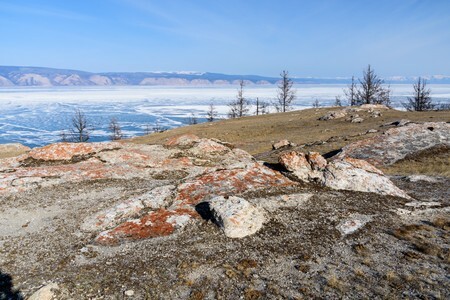 The Baikal Lake crossing begins from Olkhon Island, a kind of sub-arctic desert, where the absence of snow reveals rocks covered by orange lichens. In the background, the clear ice of Lake Baikal. 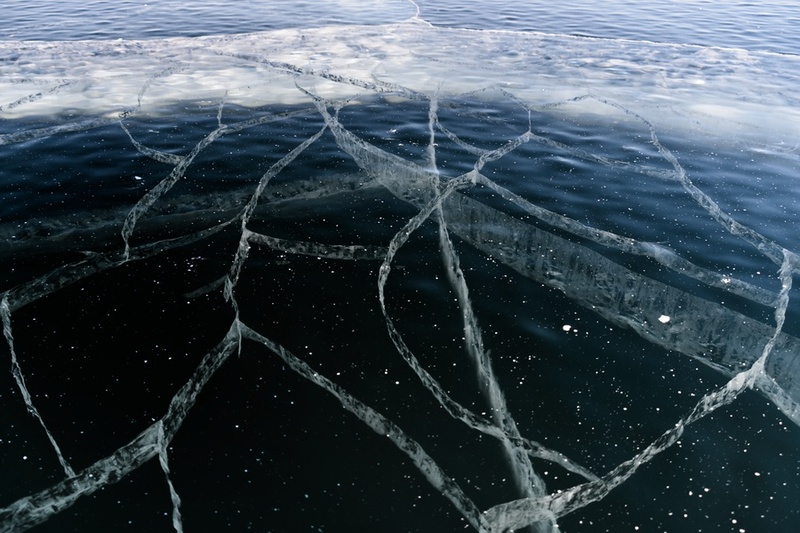 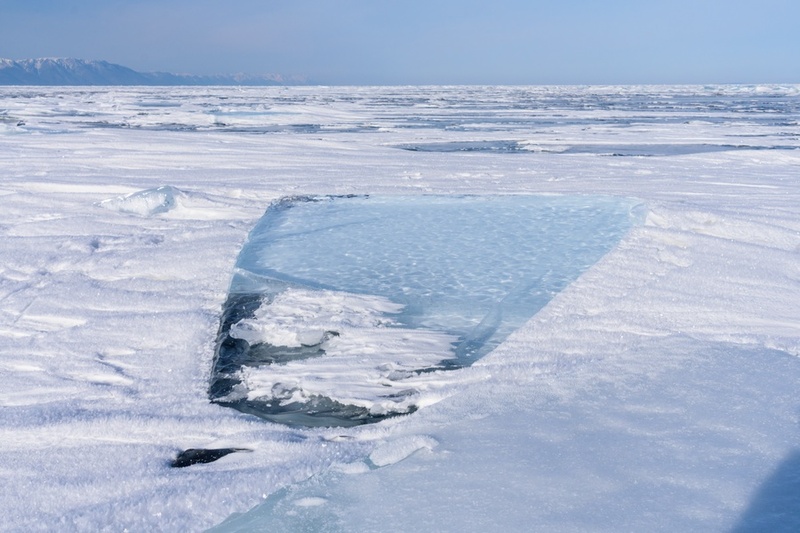 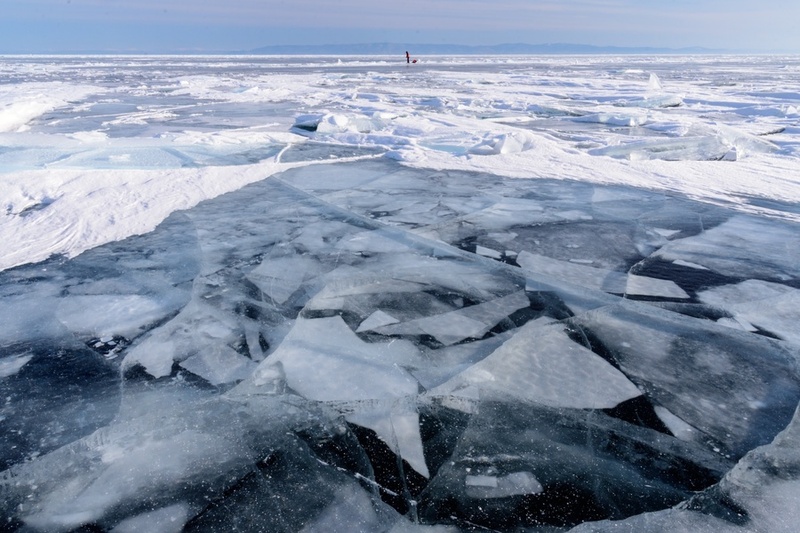 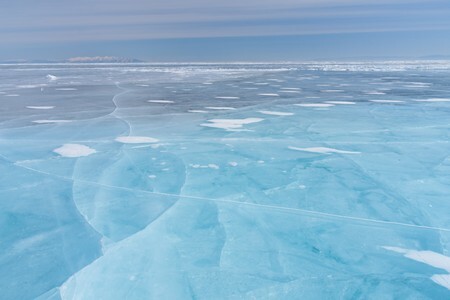 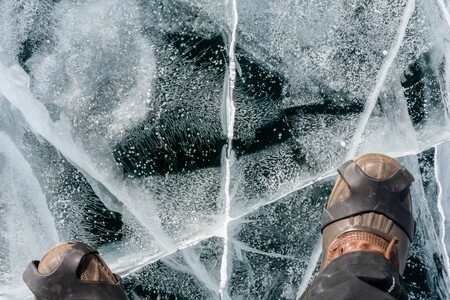 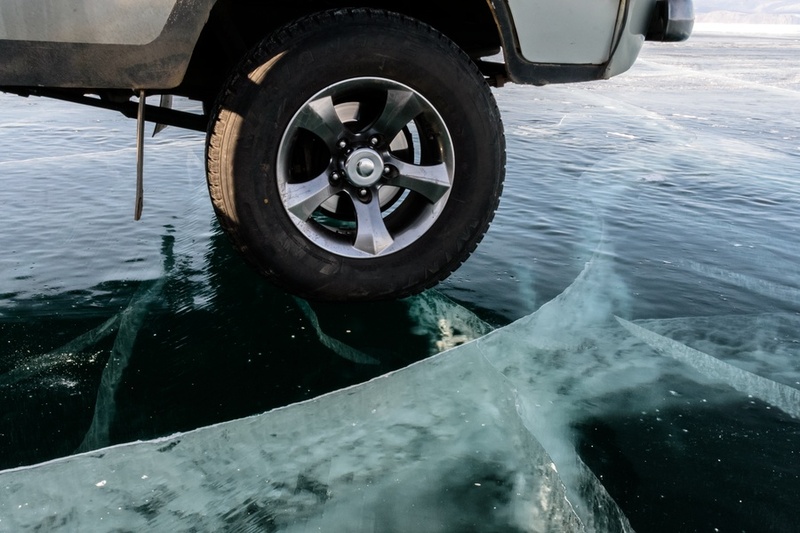 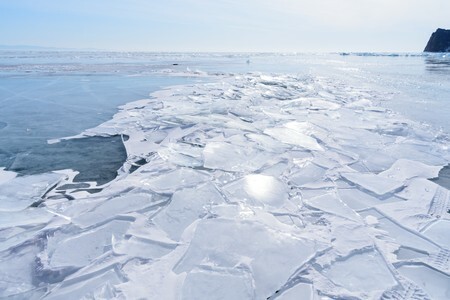 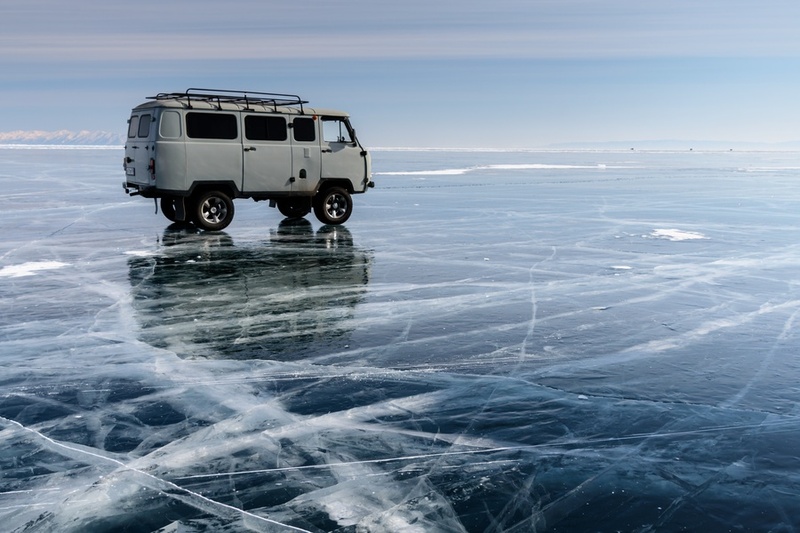 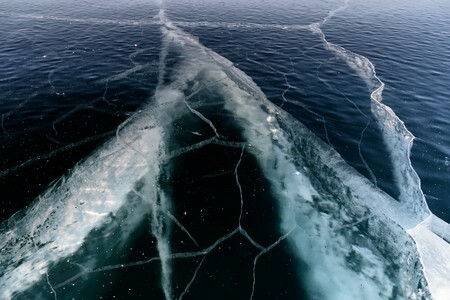 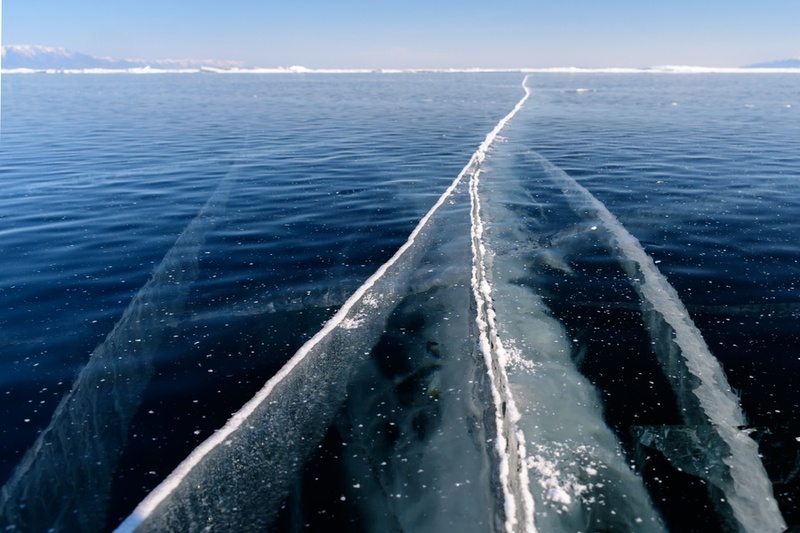 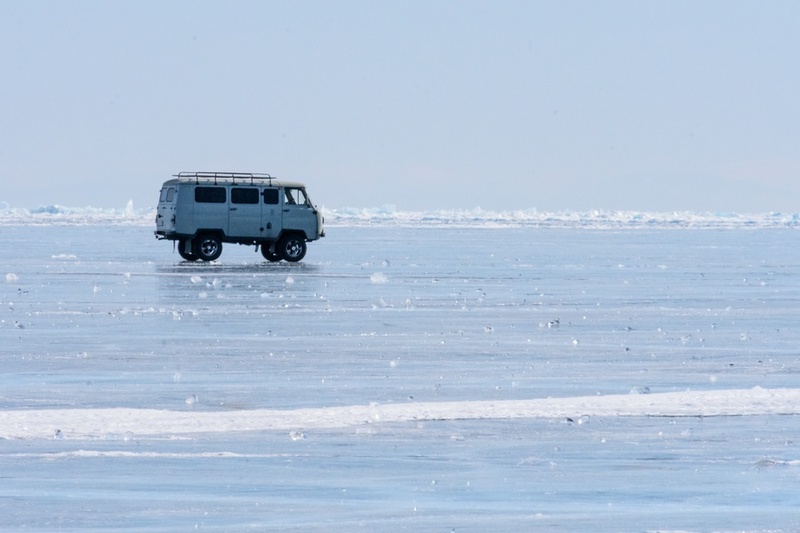 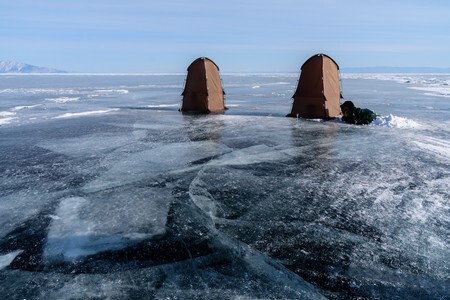 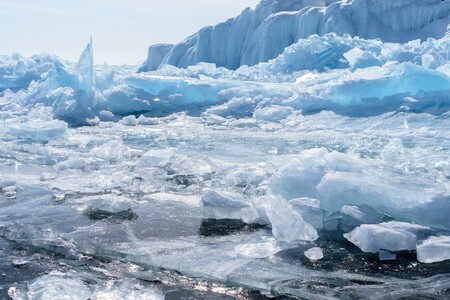 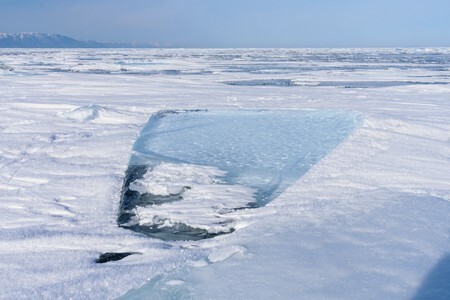 Once the van gets on Lake Baikal, the vehicle has to negotiate several fractures in the ice, which are created by the enormous pressure throughout the ice sheet. Generally the passengers are let off the van, either to lighten the vehicle, either to give the opportunity to enjoy the scene from outside, in a beautiful surrounding. 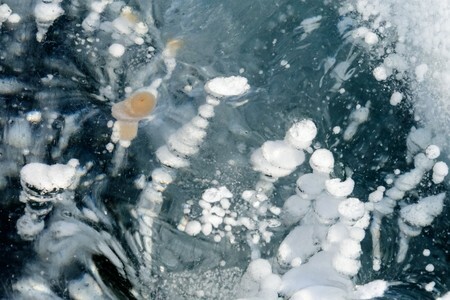 Methane bubbles released by algae in the seabed and trapped into transparent ice, are very numerous. 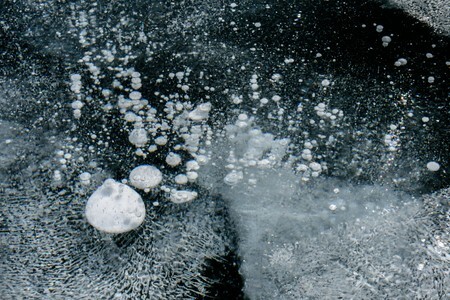 A strange methane bubble shaped like a mushroom. 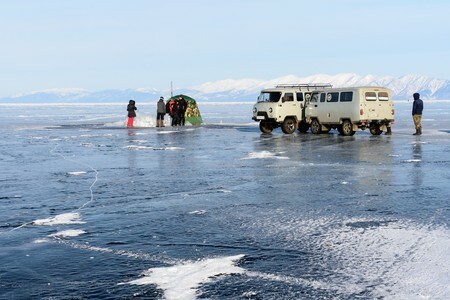 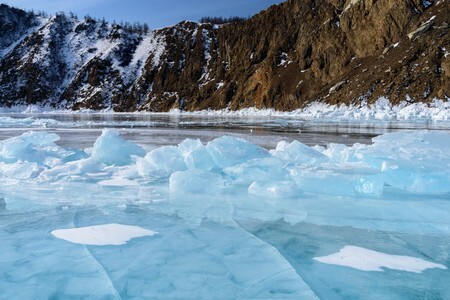 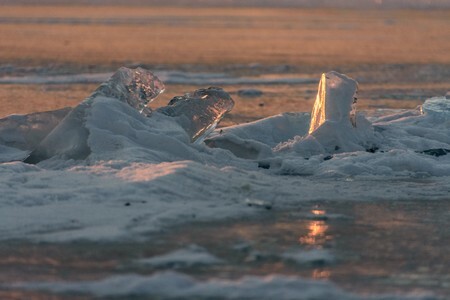 Once off Olkhon island, visitors can enjoy various types of ice among patches of snow. 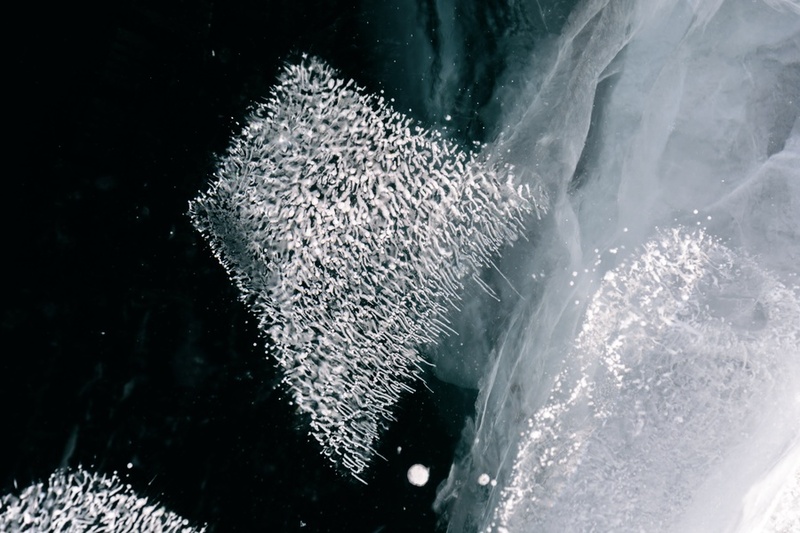 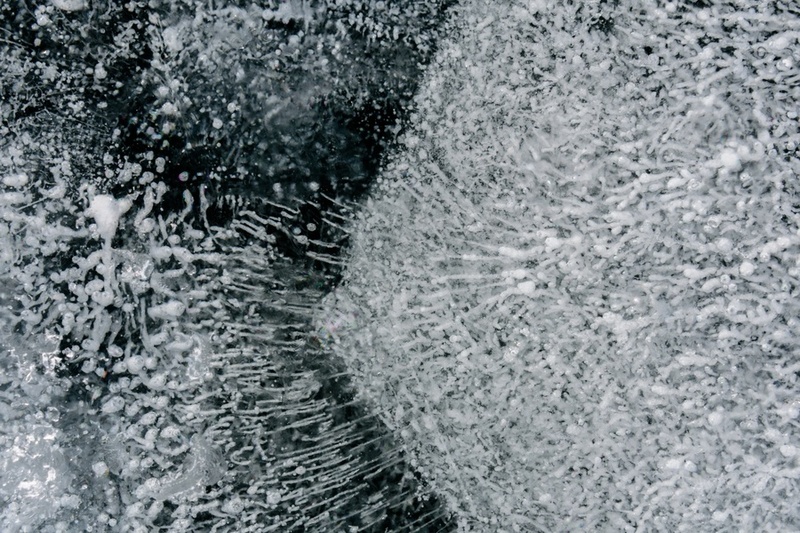 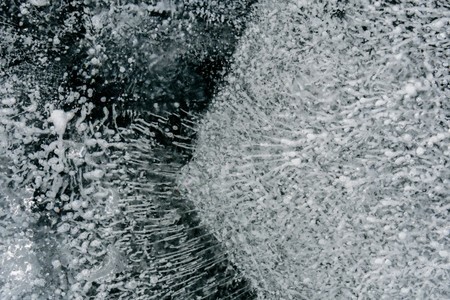 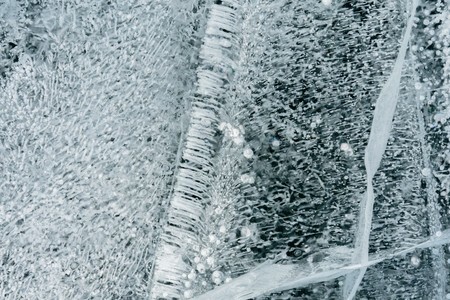 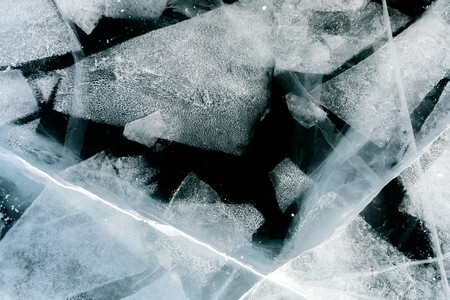 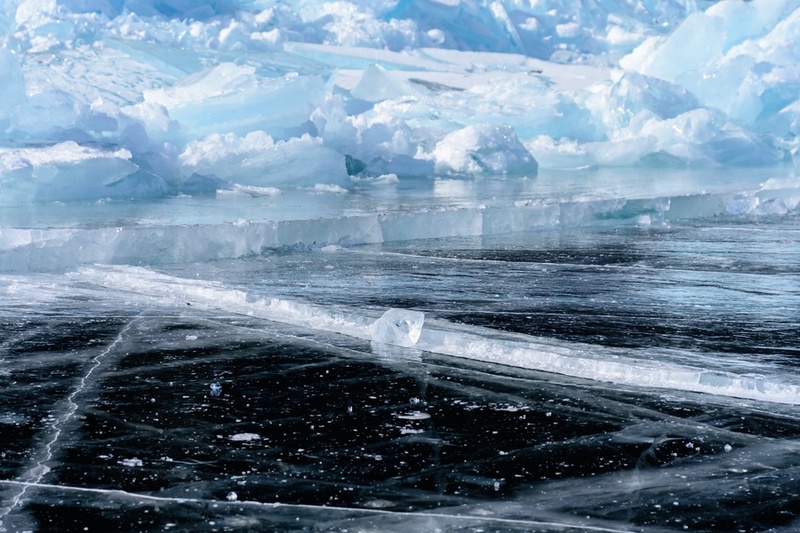 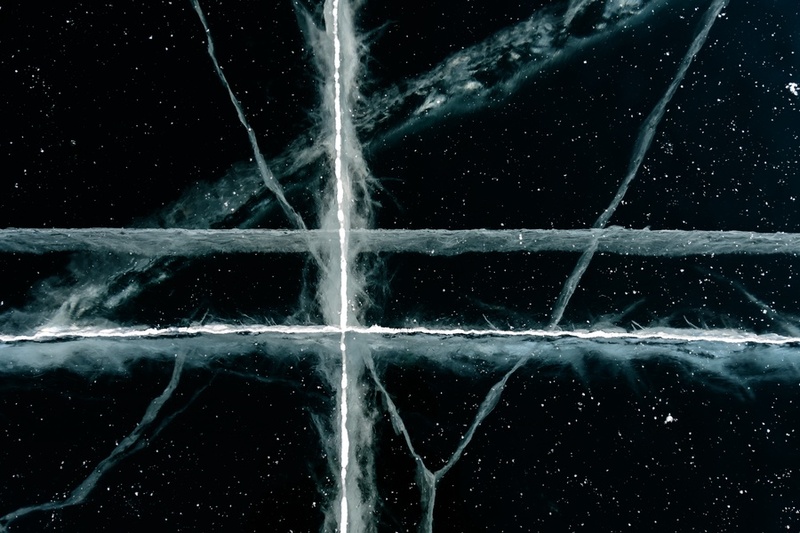 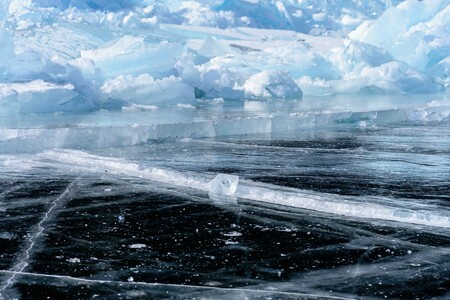 The transparent ice, which appears black, is full of veins and is incredibly suggestive. 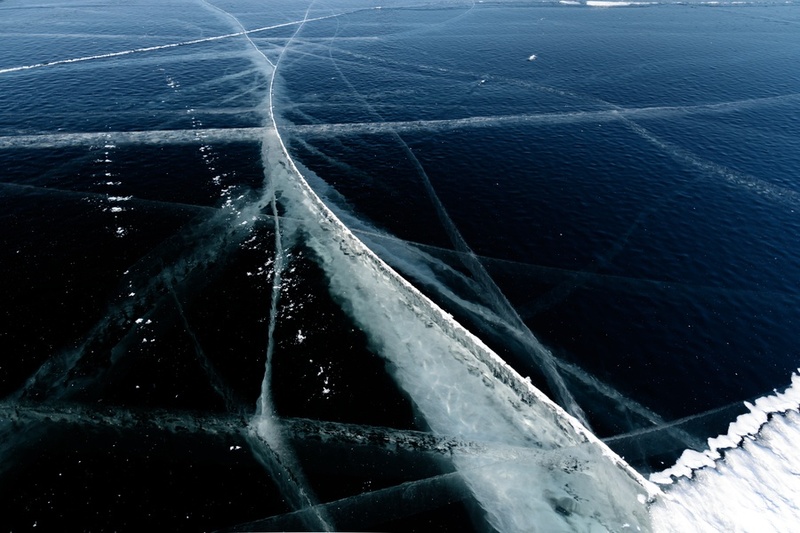 Sometimes it is like observing the vascular system of a living creature. 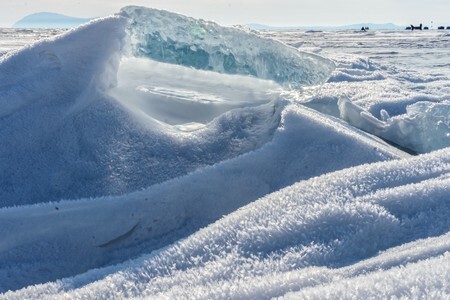 The pressure ridges in the ice are instead a chaotic mass of sheets and blocks of ice, often very transparent, which seem to have been piled up by a bulldozer that got crazy. 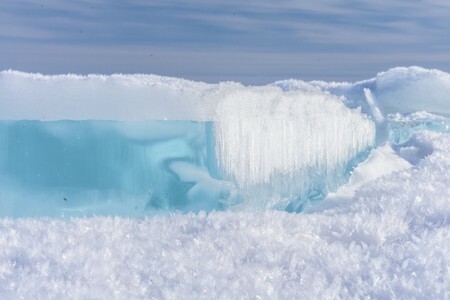 Sometimes the ice appears blue. The blue ice is very picturesque and can be find mainly near the shore. 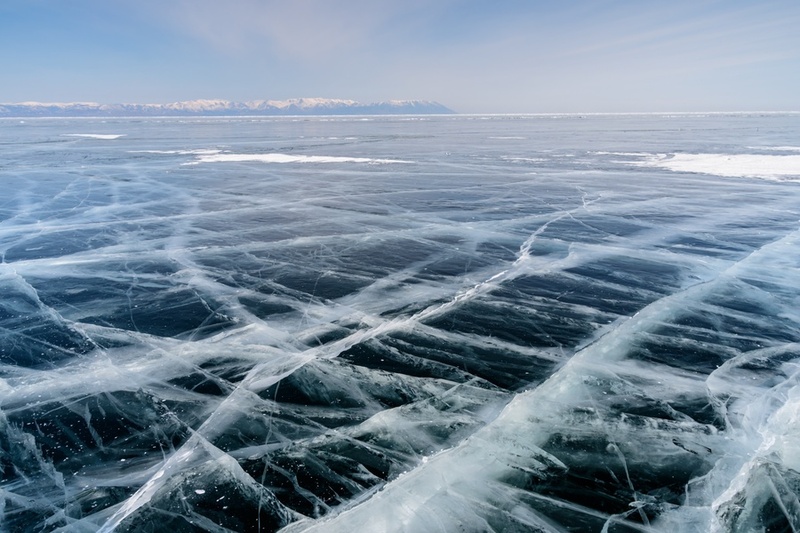 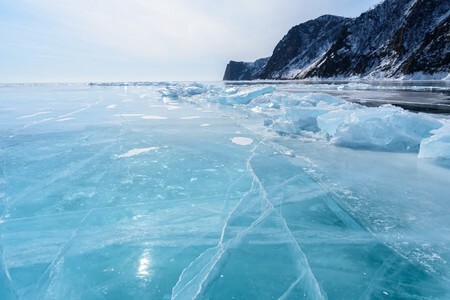 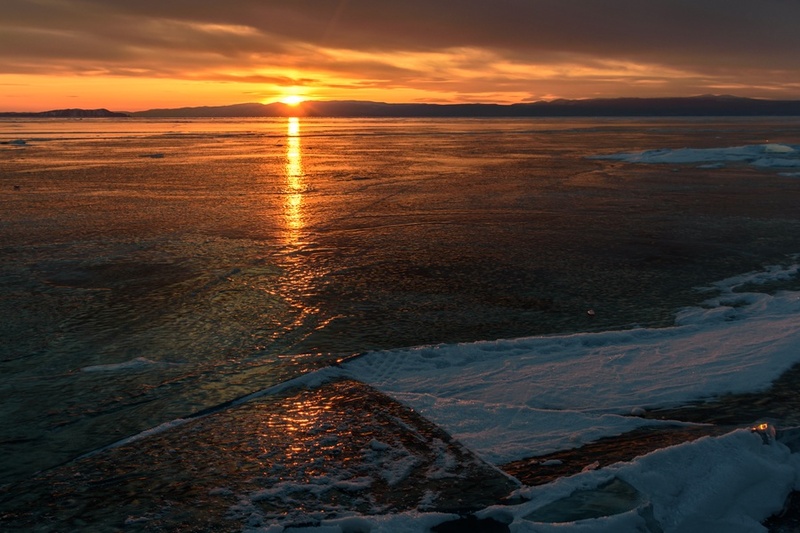 Lake Baikal is one of the lakes with greatest gaseous activity in the world, a feature evidenced by the presence of millions of gas bubbles trapped in the ice in numerous areas of the lake (and in particular along the coast). In Baikal ice camp, provided by BAIKALNATURE, visitors can stay overnight in tents over the ice. 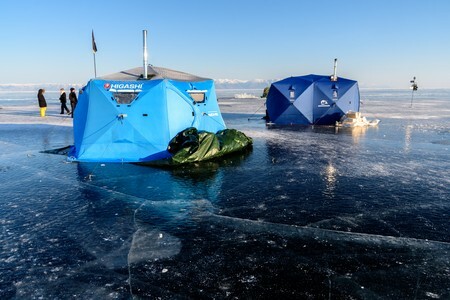 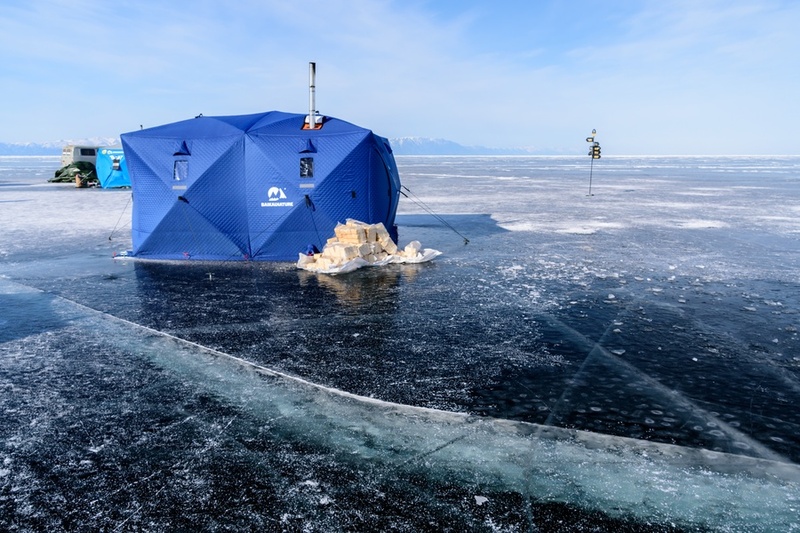 The camp is located more or less in the middle of the lake, very close to Baikal's deepest point. 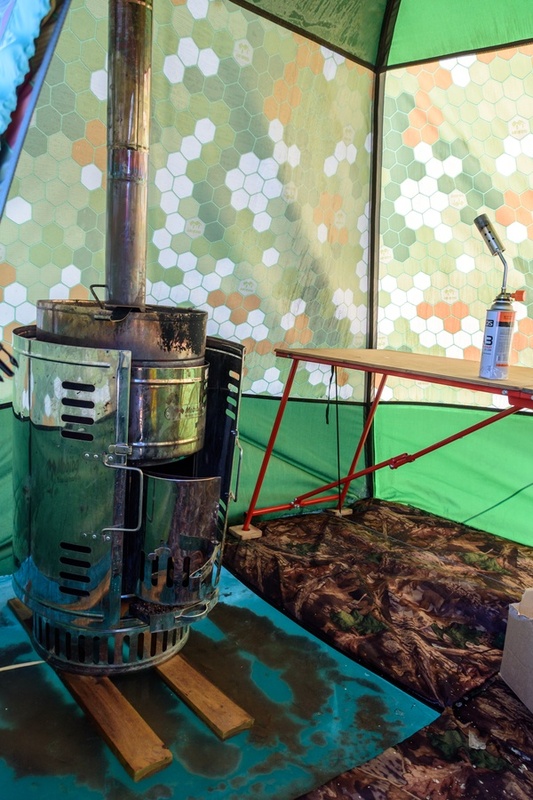 The tents are equipped with heaters that can be left on during the night and can host up to 6 people each. The smaller brown tents are instead the bathrooms. 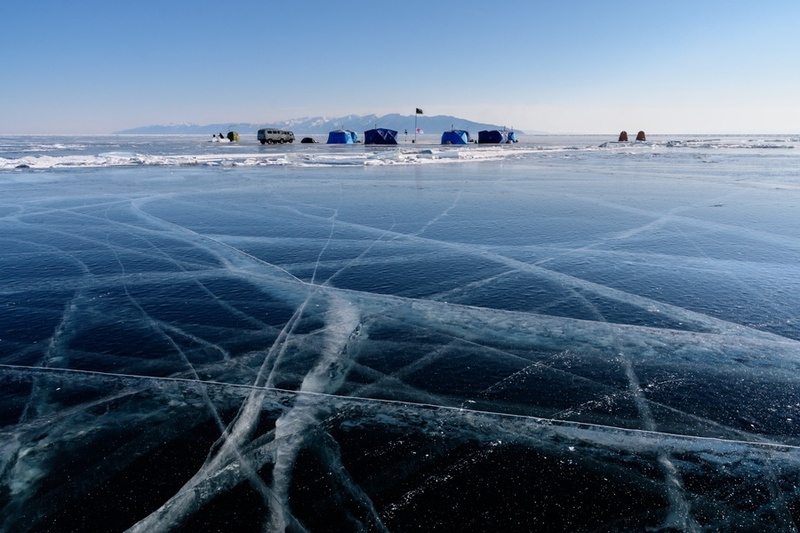 Staying in a tent on Lake Baikal gives the chance to take long walks on the ice, enjoying the place without any need to rush and without a fixed schedule. Sometimes large sheets of white ice are trapped and incorporated into transparent ice. Sometimes instead the veins in the ice are so precise that looks like made by aliens. 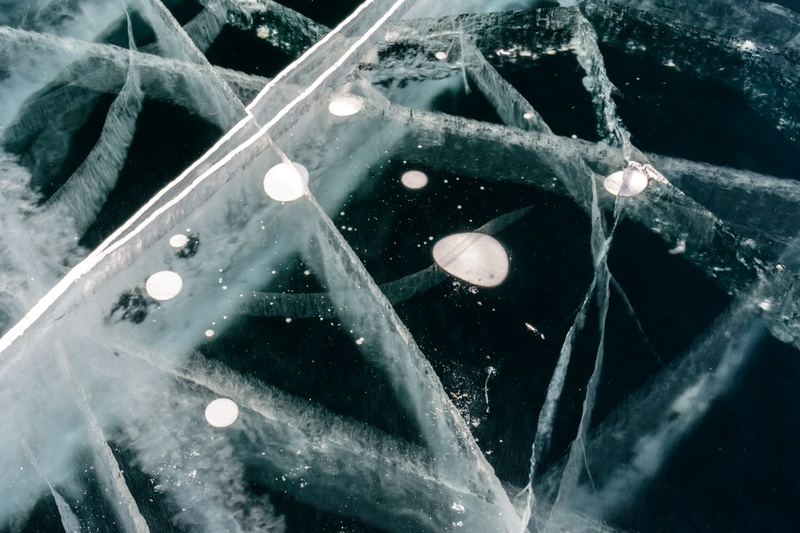 Not far from the base camp, I found an area of the lake covered by snow: anyway, more than snow, they are rather un-amalgamated ice crystals that cover large blocks of transparent ice. 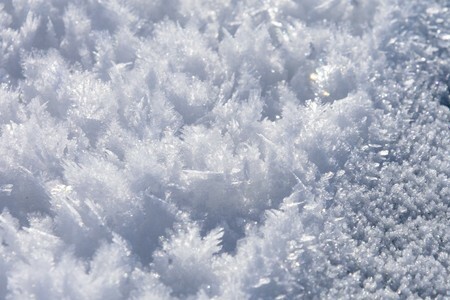 The ice crystals are usually so light that they can be blown away even by a light breeze. 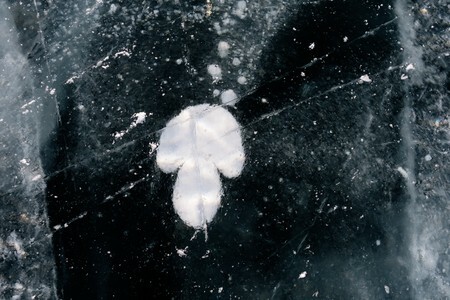 It is difficult to make, for example, a snowman or a snowball, because this type of snow does not aggregate. Bathing in Lake Baikal. 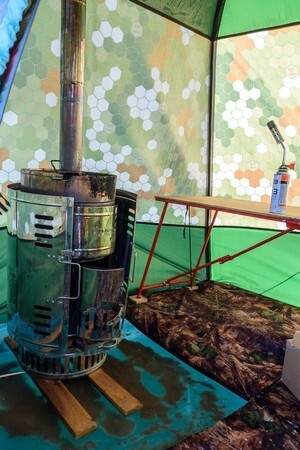 At the base camp there is a sauna tent, for those who want to experience the thrill of the so-called "banja". 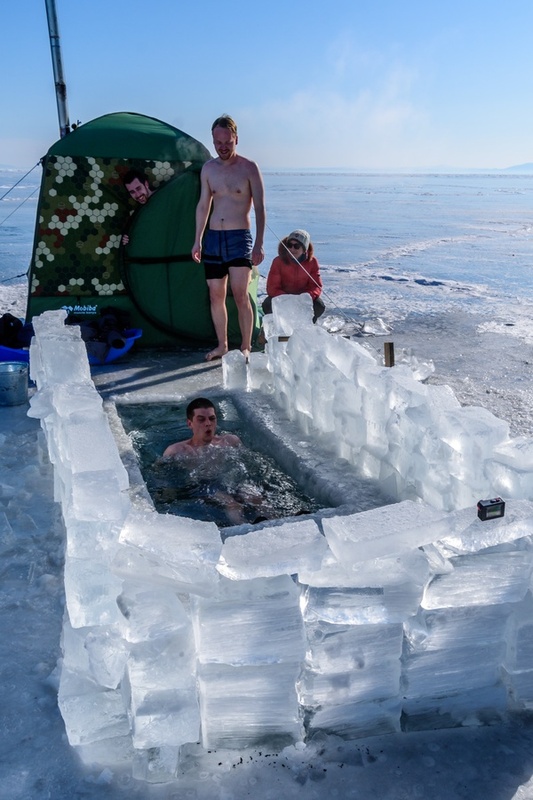 In essence, you can warm yourself well in the sauna, then dive for a few seconds in the cold water of the lake, before returning to the sauna. I preferred not to try, but it looks to be very safe and, maybe, also funny. 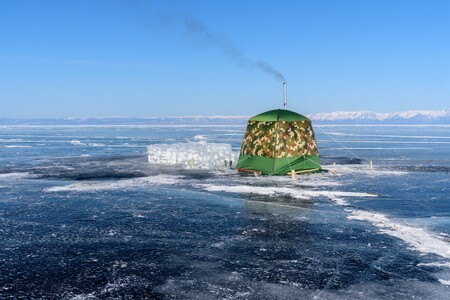 Staying in a tent on Baikal also gives the chance to enjoy sunset and sunrise directly from over the ice. 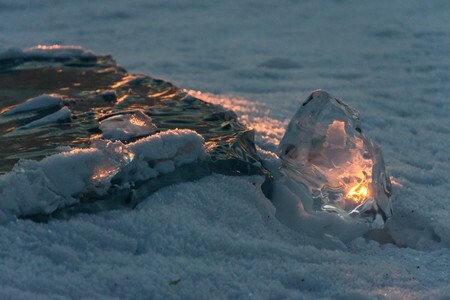 The transparent ice blocks reflect the orange light of the sun, looking like many small candles.